This dog cake is a 4 tier cake which I carved legs into and covered with fondant. Then for the head, I made rice crispy and carved the head and covered it also in fondant. For the coloring, I used vodka and food color if you have any questions don't hesitate in asking. Great place here! Go to yummydocs at http://www.yummydocs.com/ for formal letter template and resignation letter sample at http://www.yummydocs.com/formal-letter-template and http://www.yummydocs.com/resignation-letter. A wonderful dog cake. 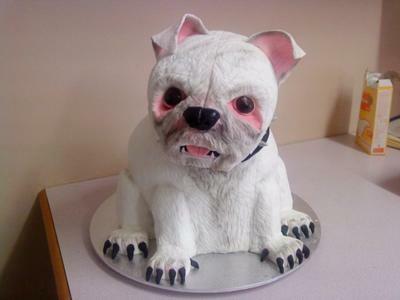 I have recently made a dog cake in a similar pose. I made the head with a cake dummy secured onto the body with a dowelling rod. Although the head stayed on it had started to move at the back of the neck as if it wanted to fall forward. Have you any tips as I thought by using the cake dummy I would not have any gravity issues. Any assistance would be great as this is driving me mad. On a previous cake I used rice krispies and marshmallows covered with forndant but found it too heavy. Probably something I am doing wrong but not sure what? I have to create a pitbull dog shaped cake for the 25th of March and I don't know how to begin. How did you get the ears to shape like that? My daughter wants a Chihuahua cake and I am going to attempt it in the next year.. any advise.. you could give would be greatly appreciated.